MERCEDES-BENZ C-class is a vehicle of the middle class. The generation of a compact executive car produced by Mercedes-Benz, called C-Class (W202) introduced in April 1993 and became the official founder of “C” series. Mercedes W202 was a replacement to the popular Mercedes 190 range, produced nearly a million cars. The new model kept the basic principles which traditionally put the Mercedes-Benz car out of time and out of fashion: it is the design in all details, the combination of traditional solutions and new technologies (such as a multi-link rear suspension as an optional feature of a classic rear-wheel-drive). 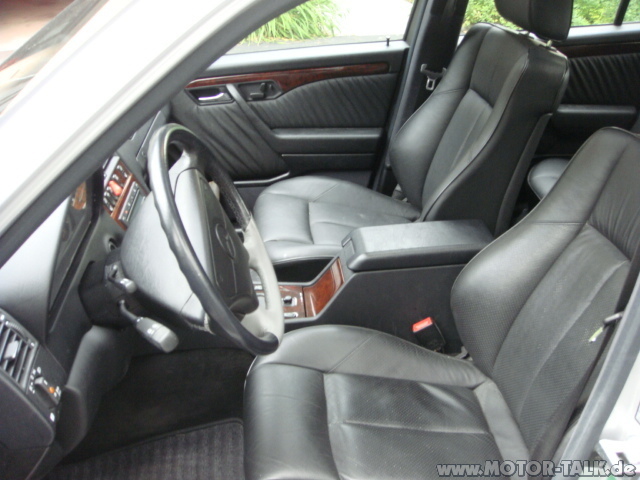 This car has an excellent overview and the selection of all interior parts. Sizes are not amazed (4480x1720x1415 mm), but in comparison with its predecessor, rear seats are not so closely. The folding rear seat row allows transporting flat long things in the trunk and its threshold is located low. The standard model is equipped with electric windows. The automatic button switches off headlights and fog lamps, there is heating of side mirrors. The C-class is paid attention to the passive safety. The standard equipment has ABS, a driver’s airbag, height-adjustable pre-tensioners seat belts and catalytic converters of discharge gas (it is the environment care). Firstly for many years the C-Class got different trim levels. Classic is the base trim that comes with Brighton cloth seats. Sport comes with the carbon trim of a center console and sport tires of 205/60 R15. Elegance trim as the best one of the C-class is a walnut veneer finish and a leather steering wheel according to interior color. The Esprit version has the aluminum console and reduced clearance focused on the youth. All trims can be combined with all types of engines. Originally W202 range includes models of C180, C220 and C280, equipped with four-and six-cylinder gasoline engines such as M102.910, M111.960 and M104.942 issuing the output of 122, 150 and 193 hp and well-known diesel vehicles: C200 D, C220 D and C250 D with economical engines as OM601.911 (75 hp), OM602.911 (95 hp), OM603.911 (113 hp). However, the most attractive model is still C220 D, combining the economical four-cylinder atmospheric diesel engine (7.9 liters/100 km) with the driving agility in a city. In October, 1993, a resourceful but economical 2.0-liter gasoline engine M 111.940 (136 hp) was presented and was a good company to a more expensive 2.2-liter engine M111.960. There was the successful modernization of the image of the model in June, 1994. The C-class started to be equipped with standard passenger airbags and remote-controlled rear seats headrests without extra charge. In August, 1995 the dashboard was changed. There were also dynamic models as: a turbo-diesel C250 of 150 hp (OM603.961) and a gasoline C230 Kompressor of 193 hp (Roots supercharged). Originally the 2.3 liter four-cylinder engine, having the power as the 2.8 liter 6-cylinder one, was intended only for a roadster SLK. The expansion of engine range was needed, because the power of uncharged engines were not suited the fast German drivers. There is the tuned Mercedes-Benz C36 AMG with the “crazy” 3.6-liter V6 engine producing 280 hp and accelerates to 100 km/h in just 6.7 seconds (but consumption of the 98th gasoline comes to 17.5 liters/100 km in a city). The standard transmission of this model is a 5-speed gearbox. In the winter of 1996 the four-door sedan W202 family was completed by the five-door station wagon Touring (abbreviated T). The luggage capacity of the compact sports station wagon of Mercedes is larger than its competitors as BMW 3-er Touring and Audi A4 Avant. This station wagon of C-class has a luggage compartment of 465 liters with the normal position of rear seats, and with folding rear seats the capacity increases to 1510 liters. In 1996 all models of C-Class were supplemented by new heating and ventilation systems and the air filter in the cabin. In the middle of 1997 the model was upgraded with the redesigning of a body: bumpers, a grille, spoilers and door sills were modified. The main innovations are related to the construction. There were upgraded engines and new automatic transmissions. The 1.8 - 2.0-liter four-cylinder gasoline engines of 122 hp and 1.36 hp got variable valve timing. There were two 2.3 liter (150 hp) and 2.4 liters (169 hp) gasoline engines and a 2.2-liter diesel one. According to the popular opinion, the best engine is a 2.2-liter gasoline engine and C280 with a 2.8-liter V6 engine of 197 hp is for speed fans. In 1998, diesel engines were moved up into the Common-Rail system: C200CDI (102 hp), C220CDI (125 hp). The most powerful indirect-injection 5-cylinder diesel engine of the C250 TD model producing 150 hp and provides even better dynamics, but not economical. C-class station wagons are equipped with the same engines. Any C-class model is available with a 5-speed manual or automatic hydro mechanical transmission. But C43 AMG models are equipped with only an automatic gearbox. The 4.3-liter eight-cylinder engine of 306 hp provides them the uncommon dynamics. Besides the engine, this model is distinguished by special trim, modified bumpers, a stiffer suspension with the reduced clearance and 17-inch wheels with low-profile tires. The presentation of the third-generation of Mercedes C-class on the new platform W203 was held in March, 2000. The novelty became a little bigger and increased dynamics. The exterior of a car looks like a reduced S-class vehicle and differs in the sports style of CLK models. A classic, massive grille is successfully combined with the original headlights, indicators in side mirrors. The excellent aerodynamics of the new body is better than BMW 3 Series. The body structure and chassis are also changed. There is a new front McPherson suspension on triple wishbone, a “pointed” pinion steering, and increased ventilated disc brakes. The structure of the front end includes easily removable crushes modules for quickly replacement after an accident. The collision rate of up to 15 km/h front module absorbs the impact energy, leaving the body intact spars. To reduce vibration transmitted from the front wheels and the engine body used aluminum sub frame, which is mounted on the suspension and power train. The basic package includes more than twenty-car technological innovations, previously used only on the highest class models. The interior has two front (two-stage operation) and two side airbags and two side safety “curtains” for the front passengers. Two side airbags for rear passengers are available for order. Owing to refuse the spare wheel the capacity of the luggage compartment is increased. Instead of it there is electric compressor for tire inflation and the special tire sealant Tiretit. There are three traditional versions: Classic, Elegance and Avantgarde, which are different in trim and equipment. The basic Classic is the “classical restraint”. More expensive Elegance has better equipment, including chrome trim elements, 15-inch alloy wheels and the leather steering wheel; the dynamic modification of Avantgarde consists of bluish tinted glass, aluminum trim parts and 16-inch alloy wheels. In the autumn of 2000 there were two more versions of “luxury” equipment of AMG, tuned by Designo saloon. The Classic standard equipment line includes: a steering column adjustable for height and angle, a multifunctional steering wheel, an armrest with compartment for small devices, heated side mirrors, power windows, a remote control of trunk lock, head restraints of rear seats, the system of tension and restrictions effort pre-tensioners seat belts of the front and outer rear seats, a Window-Bag unfolds as a curtain between the front and rear racks, automatic heating and ventilation systems with recirculation, the automatic climate control, an outside temperature sensor, two-stage front airbags, inertia seat belts of rear seats, an automatic child seat recognition, the presence of recognition passenger in the front seat, a tachometer, wood trim of Calyptus Linea; the automatic inclusion beam headlights, fog lamps, a dust filter, the antenna on the rear window, the cruise computer, ELCODE; a six-speed manual gearbox, indicators on side mirrors, the power steering, side airbags in the front doors, SPEEDTRONIC system, allowing to set an individual top speed, cloth seats “York”; a touch screen wipers, the tire sealant “Tirefit” with an electric compressor, the green heat-absorbing glazing, ASSYST; ABS; ESP; Brake-Assist system; the crash sensor of central lock. Optional standard equipment of Elegance includes: an height-adjustable armrest in the center console, with the compartments for devices, highlights in the front doors for easy entry/exit, the roof and windows trim of anodized aluminum, trim of a noble tree Laurel; a glossy gray grille with chrome, the leather steering wheel, alloy wheels 6 J x 15 with seven holes, the gear lever trimmed by the interior color, chrome side moldings, interior color seat belts, sun visors with illuminated mirrors; cloth upholstery Cambridge; bumpers with chrome plates, body-colored door handles, with chrome lining. The optional standard equipment of Avantgarde: an height-adjustable armrest in the center console, with the compartments for devices, highlights in the front doors for easy entry/exit; wide section tires 205/55 R 16; , the roof and windows trim of anodized aluminum, aluminum trim of interior; a glossy gray grille with chrome, the leather steering wheel, alloy wheels 7 J x 15 with five holes, the gear lever trimmed by the interior color, special shape door sills, chrome side moldings, interior color seat belts, sun visors with illuminated mirrors; cloth upholstery Derby; bumpers with chrome plates, body-colored door handles. The standard equipment of the new C-class is the multifunctional steering wheel, Speed Tronic, the central display, ESP, the onboard diagnostic system (for gasoline engines), the local heater (for diesel engines), the automatic inclusion beam headlights and etc. The optional equipment includes a navigation system displaying the current traffic situation, the automatic Thematic Thetmotronic system with an absorbent carbon filter, an audio system COMAND, including the radio, CD-player; the voice control system of radio and telephone Linguatronic, the automatically adjustable audio system; TV, the sliding sunroof with memorized position, the system of Tele-Aid, automatically sending the SOS signal to the nearest emergency service when an accident, the TeleDiagnose system, connecting to the service center of Mersedes-Benz. The power plants are significantly upgraded; producing the power corresponds to the similar models of BMW of 3 Series. The basic C180 comes with a 2.0-liter (not 1.8-liter) four-cylinder engine of 129 hp that is enough to compete with the BMW 318i. The same engine with interior blower is able to issue 163 hp. It is installed in the C200 Compressor. The dynamic characteristics of this car are better than BMW 320i has. The torque of 230 Nm of the C200 Compressor accelerates a car to 100 km/h in just 9.3 seconds. The top speed is 230 km/h. Six-cylinder V-shaped engines of 2.6 and 3.2 liters with the output of 170 and 218 hp are used in the models C240 and C320. In the first case it is a rival of BMW 323i, and the second - BMW 328i/330i. Diesel models as 200CDI, C220CDI C270CDI are equipped with well-known 2.2-liter (4-cylinder) and 2.7-liter (5-cylinder) turbo-charged engines with Common Rail system producing 115, 143 and 170 hp. All of them differ in the low fuel consumption and comfort driving with even engine speed between 1500-2000 r/min. The new model C270CDI has the high speed of 230 km/h that is more than the previous model C 250 Turbodiesel by 27 km/h. All engines are equipped with a new 6-speed manual transmission, and a hydro mechanical 5-speed automatic gearbox upon request (except C320). The C320 model is available with tip tronic. Until 2001, all models of the new C-class were only sedans. In the spring of 2001 there was the presentation of a 3-door hatchback, and then 5-door station wagon T-Model. That’s why the production of the T model of the previous generation lasted for approximately a year. Station wagons are available in 10 variants with diesel and gasoline engines having the output of from 102 to 347 hp (from the economical diesel C200T CDI to the station wagon C55T AMG). Since the spring of 2004 Mercedes-Benz begins selling the C-class cars in sports packages. The standard package includes 17-inch wheels with 225/45 front and 245/40 rear tires. In addition, the stiffer suspension lowered the body by 25 millimeters in front and by 15 millimeters at the rear. There are strengthened brakes on the front wheels, the oval stainless steel exhaust pipe instead of the usual one. Diesel models got two chrome exhaust pipes. Vehicles with 6-cylinder engines (C240 and S320) got the upgraded exhaust system, which has the sports car sounds. The cabin was also changed. Now there are sports seats, the three-spoke steering wheel, covers plates on pedals and velour floor mats. 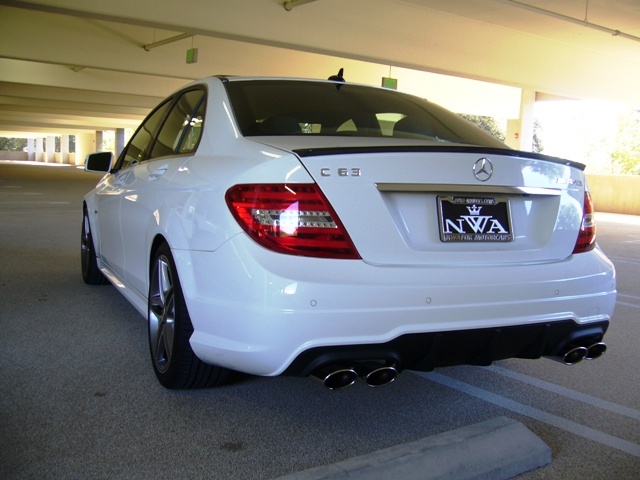 More sporty drivers are offered some versions of the tuning saloon AMG. They got a new aerodynamic package and 17-inch alloy wheels designed of AMG. Four-wheel-drive cars 4Matic, which are available for tuning of AMG (C32 AMG and C30 AMG), will not receive the factory sports packages. In 2004 there was the modernization of the C-class models (interior changes: more comfortable seats, expensive trim and a new dashboard) allowed staying afloat in a sector where new rivals came every month. The world premiere of Mercedes-Benz C-class of the new generation took place at the Geneva Motor Show in March of 2007. German experts were preparing for this debut for a long time. During the development the new C-class passed over 100 crash tests. The car gathered the latest innovations of DaimerChrysler AG engineers. It is the time of sharp edges, sharp corners and the drawn wheel arcs. In general, the C-class looks presentable: the extremely short front overhang, the wedge-shaped silhouette, the high rear body end. At first in the history of this model the car is available in three versions, which differ not only in the interior, but the exterior. Mercedes-Benz presents Classic and two original lines: Elegance and Avantgarde, including individual characters and the rich set of technical features. Owing to this concept customers can make exact choice C-class according to technical characteristics. The client can choose the design of the grille. The Classic sedan has a flat false grille, the Elegance sedan has a relief grille, curved around a center bar. A complete set of Avantgarde three-beam star is located in the center of the grille, as in the sports models, Mercedes-Benz. In embodiments, Elegance and Classic three-beam star, as in the previous generation - is located on the hood. The length of the novelty is 4581 mm that is longer than its predecessor by 55 mm. The width is increased by 42 mm up to 1770 mm, and the wheelbase - by 45 mm up to 2760 mm. The trunk capacity is increased by 20 liters up to 475 liters. When changing generations C-Class got a more rigid body. The body structure consists of 70% of high-strength steel, which is the basis of passenger safety. Compared with the previous model range the new car has enlarged crumple zones and optimized absorption of collision energy. In front of the body four independent of each other deformation zones that effectively absorb collision energy, “averting an impact” from the cabin with passengers. The interior design is laconic. The excellent quality of materials: soft plastic, aluminum or wood inserts, chrome and leather. The smart ergonomics allows feeling comfortable in a vehicle. The C-class balance of comfort and control is very good. And the main reason is the new-link front suspension and the multi-link rear suspension, located on a stretcher with hydro bars, absorbing vibration. Compared to its predecessor, the new C-Class is equipped with the greater number of new safety and comfort systems. They include the Pre-Safe system, controlling the distance to cars in front and not only informs a driver about any danger but also can brake when needed. Among the new technical features of the novelty there is the system Agility Control which controls the shock absorbers depending on the speed and driving style. The system constantly changes stiffness of a suspension even just when it is needed. Depending on a situation the suspension may be harder or softer. The Adaptive Brake system helps to drive on the rise and has many other “smart” options. Bi-Xenon headlights of the novelty have five operating modes depending on the lighting conditions. Even the basic C-Class of 2007 is equipped with seven airbags: two adaptive front airbags for a driver and a front passenger, the knee airbag for a driver, two side ones, placed in the backside of the front seats, and two full-size window airbags, opening when the side impact along the entire space from the front to the rear rack. Most engines of Mercedes-Benz of the new generation C-class are from the old model, but all power plants are redesigned. As a result their power increased and fuel consumption reduced. The engine range includes diesel engines: C200 CDI R4 of 2148 cm³/136 hp; C220 CDI R4 of 2148 cm³/170 hp; C320 CDI V6 of 2987 cm³/224 hp. Gasoline engines: C180 K R4 of 1796 cm³/156 hp; C200 K R4 of 1796 cm³/184 hp; C230 V6 of 2496 cm³/204 hp; C280 V6 of 2996 cm³/231hp; C350 V6 of 3498 cm³/272 hp; C63 AMG V8 of 6208 cm³/450 hp. The last engine is placed in the most powerful vehicle of Mercedes-Benz C-class, which was presented by the tuning studio AMG. This engine is hand-built. The maximum torque is 600 Nm, where 500 Nm is achieved at two thousand revolutions per minute. C63 AMG accelerates up to 100 km/h in 4.5 seconds and the electronically limited top speed is 250 km/h. The engine works with a seven-speed automatic transmission. AMG gave to C-Class an aerodynamic body kit, a new hood, and exclusive 18-inch wheels with 235/40 tires on the front axle and 255/35 ones at the rear. 19-inch wheels are as an option. In addition, the experts of studio installed a new front suspension with an increased gauge by 35 mm, an adjustable sports suspension and the reconfigured steering wheel. The sedan got better brakes - front six-piston with 360-millimeter perforated discs and rear four-pistons with 330-mm discs. Mercedes C63 AMG is also equipped with ESP. The system can be completely switched off or activated in a sport mode. In 2011 C-Class was upgrade again. As before, the updated Mercedes C-Class is available as a sedan and a station wagon. By 2011 there is the line of a 2-door 4-seater sports coupe. The model of 2011 looks really fashionable; it is distinguished from its predecessor by two thousand new details. The new model got ten new assistance systems, the new range of engines, the advanced automatic transmission 7G-TRONIC PLUS, and the system of “start-stop ECO”. The front and rear ends of the best-selling Mercedes model got brighter design. New contours of the front bumper with the new design of LED lights give the car a more expressive and dynamic look. The central air intake is V-shaped. The large side air intakes are getting to the side of the car, adding a sporty exterior. The hood is made of aluminum, thereby reducing weight and, consequently, lower fuel consumption. The updated C-Class is still based on the W204 platform, so the chassis have no radical design changes. Dimensions (and wheelbase) of the modernized version are also remained unchanged so there is enough spacious inside. The ergonomics allows feeling convenient in the car. The interior has functionality and the modern design. The main design work was done to restyle the dashboard with the integrated high quality display and improved and more detailed function touch screen. The center console became more modern and premium. Instruments are located in deep wells, and the common spirit is from CLS sedans and E-class models. The interior is made of only quality materials: Brighton cloth seats, the soft plastic. The particular attention is paid to the ergonomic of driver’s place: the leather-covered multifunction steering wheel is adjustable by the angle and reach. And the front seats are moved not only up and down, but they are also adjustable by the height. The cabin of the car is soundproofed, there is calm and quiet when driving. The standard version includes radio-stereo Audio 20CD (player MP3), Headset Bluetooth, the two-zone climates control Thermatic, the adaptive cruise control with function Tempomat Speedtronic and more. There are music harman/kardon LOGIC7 with 12 speakers, the navigation Becker MAP Pilot system, 3-zone climate control Thermotronic, the leather upholstery and other attributes of the automotive luxury as the optional features. The luggage capacity varies depending on the body type. The coupe has the smallest capacity - 450 liters. The sedan trunk capacity is 475 liters (VDA), and folding rear seats (extra charge) allow long things. The station wagon has to 1500 liters with the maximum length of up to 2.82 m (with folded rear seats). When rear seats the station wagon has the luggage capacity of 485 liters. The tailgate is electric and able to be opened and closed by the key pressing. The range of power plants is refined thoroughly: the central place occupied gasoline and diesel engines with direct injection of fuel. The new engine is only one - V6 with an innovative and highly efficient process BlueDIRECT. The output of this engine is 306 hp and 370 Nm of the torque (previously it was 292 hp and 365 Nm). The base engine is C180 with a 1.8-liter turbo engine of 156 hp with a maximum torque of 250 Nm. Then it is C250 of 204-hp with the maximum torque of 310 Nm. As for diesel engines there is C220 CDI of 170 hp (400 Nm) and C250 CDI of 204 hp (500 Nm). All standard diesel power plants the basic gasoline ones are equipped with a six-speed manual transmission, and other with a seven-speed automatic gearbox. Both transmissions are adapted to the star/stop system, which is installed on the C-class for the first time. The safety of the C-class is the most advanced. Besides a lot of airbags including a driver’s knee airbag, “curtains” on windows, three-point seat belts, and “active’ head restraints Neck Pro, there are optional hi-tech systems as Attention Assist. As well as Adaptive Highbeam Assist, Active Lane Keeping Assist, Active Blind Spot Assist and Speed Limit Assist. Finally there is a comprehensive passenger protection system and Pre-Safe system. C-Class is a symbol of wealth and status of its owner.